A higher-than-average number of planning applications by the 'big four' supermarkets have been approved in Leeds recently, the BBC has found. The city council gave the go-ahead to 11 applications in the two years to November - the fourth highest total of all the UK's local authorities. 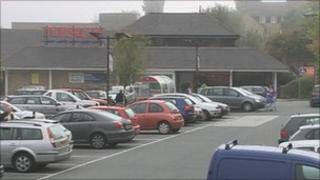 It is in line to gain more than £2m from supermarkets in contributions to the community and transport. Researchers looked at the expansion of Tesco, Asda, Sainsbury's and Morrisons. The figures cover all types of new outlet, including small "high street" stores. They were also asked how much money the supermarkets had given to local projects - so-called planning gains - as part of the process. Asda has agreed to give just over £1m, largely towards public transport initiatives, pending final approval of its application to develop a site in the Middleton area of the city. An Asda spokesman said: "This is standard practice and is designed to mitigate the impacts of the store on the public transport network. "In this case, the funds will be used to enhance existing bus services to the new store, provide five new bus stops and shelters with real time information displays and improve linkages between the existing district centre and the new Asda store." Tesco earmarked £670,000 for transport infrastructure and local amenities at its Roundhay Road development and £34,000 for public transport improvements related to an application in Selby Road. Morrisons is putting £338,000 into public transport as part of its successful application at a former cash and carry in Chatsworth Road, Harehills. Elsewhere in West Yorkshire, there were seven applications in Kirklees during the past two years, six in Bradford and one in Wakefield. There were no applications in Calderdale during the period covered by the research. Tesco won permission in September to build a new superstore in Ilkley after a controversial planning appeal. Bradford Council had rejected the firm's plan to replace its existing store with a much bigger one on a former industrial site. But the government's Planning Inspectorate overturned the council's decision after an eight-day public inquiry. Tesco said the new store would create 212 jobs, on top of the existing 145 jobs at its existing store. Residents' group Ilkley Residents Against Tesco Encroachment (Irate) collected thousands of signatures against the plans for a new store in Mayfield Road and the transformation of the current store in Springs Lane into a care home and retail units. Councillor Chris Greaves, who was chairman of Bradford Council's planning committee at the time, described Tesco's behaviour as "aggressive". "They put forward an incredible case, threw shed loads of money at it," he said. "They jumped through the hoops but I still feel the inspectorate did not take a look at reality and take on the concerns of the near neighbours." Mr Greaves said this was the third time a supermarket chain had appealed against a planning decision made by the council and won. A Tesco spokesman said: "We are delighted to have been granted planning permission for a new store in Ilkley. "This will create dozens of new jobs for local people and will bring great value and convenient shopping to the area. "Local people, through public consultation, have told us they support our plans. "That is why we want to build this store, because we are confident it will be busy and popular with local people."